This pins was released during a Disney-MGM Studios pin event in March of 2002. 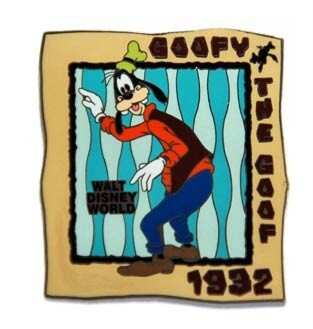 This is a square pin with Goofy in the middle waving his hand, next two him reads Walt Disney World. The frame of the pin is beige and the background is blue. The top of the pin towards the right reads Goofy with a Goofy head in the corner, coming down reads The Goof. The bottom of the pin towards the right reads 1932.